Seán Duffy is Professor of Medieval History at Trinity College Dublin. He is a graduate of Trinity College Dublin, from which he also holds a Ph.D. He is a Fellow of the College, where he has lectured since 1993 and is currently Professor/Associate Professor of Medieval History in the School of Histories and Humanities. Laoise O'Brien has a growing reputation as a virtuosic performer and imaginative concert programmer. 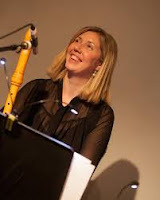 Laoise studied recorder at the Conservatorium van Amsterdam having completed an undergraduate degree on concert flute at the College of Music in Dublin. She also holds a Masters degree in Performance and Musicology from NUI Maynooth.